I just relocated to Florida and prior to then I always eat granola snacks until I visited a Publix in Florida and decided to try out their Mona's Granola and I absolutely love it. If only this product was available where I was at I'd be able to eat this as this is undoubtedly the best granola I've ever tasted and it's all natural with no added sugar other than what's naturally in it already. I especially love the fact that it's all natural with no added artificial ingredients. Definitely love that they added honey instead of sugar. Ever since I tried this product I noticed an immediate difference in taste when compared to other granolas I've tried in the past. ​I have to say that this is the best granola out there. No Sodium and Less sugar ...... than anything I can buy around here. I live in Michigan. Do you sell anywhere close or can I buy online? I really can't get over the difference. Just to compare (like you don't already know this!!) I have Kashi and Cascadian Farm organic in my cupboard now ...Kashi has 100 mg of sodium, Cascadian has 110. You have zero.Kashi - 13g of sugar. Cascadian 14g. You have 6g.WAAAAAAY better. We have Kroger, Meijer and Walmart around here. Hope to see you there soon! I have never tasted a granola as good as yours! It has the right balance of crunch and it's not too sweet. I like to eat it with by sprinkling it on plain Greek yogurt, with some diced apples and a light drizzle of raw honey. But I also grab a handful right outta the bag as a quick energy booster. GREAT STUFF! Greetings. My wife and I are visiting Florida for a couple of months (from Boston) and tried your product. We bought it from the Publix in Stuart. I have to admit that I am somewhat of a granola snob, not liking the vast majority of products out there. But I have to say, I have never tasted a granola as good as yours. I will stock up while I am here, and then we head back north to the tundra. I'm guessing that you don't sell in grocery stores in the Boston area? If not, I will purchase from your website. Until then, I will enjoy breakfast here. ​Thanks for a quality product. Being a glass artist I find it very important to begin my day with a healthy and energy filled breakfast to keep the creative juices moving. Mona’s Granola has always filled that need completely! My day, every day, begins with a proper proportion of my favorite flavor, Cinnamon and Pecan, topped with fresh strawberries, bananas, and organic whole milk. No matter where I am, home or travel, I always take Mona’s Granola with me so that I never have to do without my perfect start to the day! I eat a ton of granola. Everyday at my desk. 9 AM sharp. I'm really a mountain biker! I really enjoy the Mona Honey Almond. 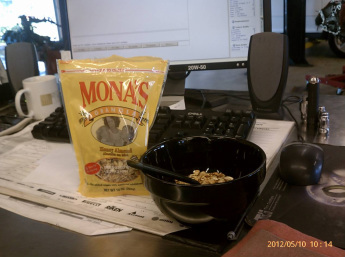 Here is a picture of my workstation, with my Mona's granola for breakfast. Saw your Granola at Publix in Tampa. I decided to try it over other brands. The cereal was delicious, moist, and reasonably priced. Just wanted to let you know that I will continue to purchase! Then I found that you were local, makes it even better! During a meeting I surreptitiously snacked on Mona's Granola right out of the package. With only a little left, I mixed it with raw oatmeal and yogurt for breakfast. I'll snack on Mona's Granola while I'm at work in my art studio! Let me know when it's available in the Northeast. Mona's Granola started me on a path to an amazing radiant difference! Having entered the “being-health-conscious” world, I am now very careful what, when and why I eat. I am even enjoying exercising. The difference has been amazing! I have grown in attitude and outlook, losing weight, my clothes fit better, and people are noticing! How does it get even better? 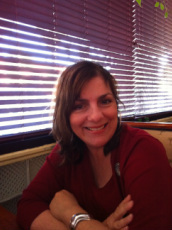 The improvement has overflowed, energizing my work as a realtor. Starting with Mona's Granola every single day, my life has forever changed. Thank you, Mona, from the old me, to someone brand new! I was raised on granola as a breakfast staple. My favorite is with a little milk, added to muffins, or with yogurt. I've been buying Mona's Granola for fifteen years! If it is sold out, I am the first one at customer service, asking for more! I'm a sophmore at Auburn University. 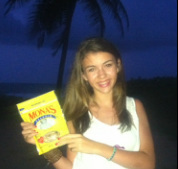 I eat Mona's Granola almost every day!! I keep it in my Dorm room for those late nights while I'm studying. It's hard to keep my sorority sisters from taking it! Ha!Ha! My younger sister and I took some with us on vacation to Puerto Rico. I've been eating Mona's granola since the day I decided to eat healthy. I had no idea that eating healthy would taste so good!! I can't go a day without my granola. I take it in my school lunches. My older sister and I packed it and took it with us last summer to our vacation in Puerto Rico!! The best granola ever! 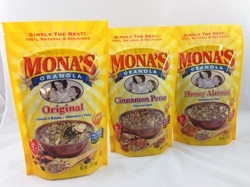 I have tried many granola's before discovering Mona's and there is no comparison. A great way to start the day. My family lived at The Belleview Biltmore Hotel while my dad managed BBH in the seventies and eighties. So, when I saw your product in Publix here in Tallahassee, I bought it right away. Oh my goodness, it is a staple now. I mix it with Greek style yogurt or mix it with my oat squares every day. Thank you Mona for bringing us this wonderful food. God bless you and your family. Keep it real! My favorite Granola is Honey Almond but I haven't been able to purchase it in my local Publix for over a month. They are well stocked with the other two varieties but seem to always sell out of Honey Almond as soon as it comes in. I'd like to suggest that you produce more of the Honey Almond to accommodate demand for it via Publix shoppers. Often when I am going away on vacation, I will buy out the whole shelf! 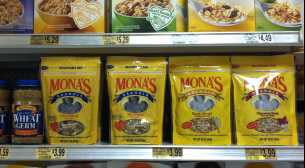 The Bluffton, SC, Publix manager, is now making sure, they stock up your favorite Mona's Honey Almond Granola! Where can I get it in Minnesota! I tried Mona's granola when I was down in Orlando,Fl. this past week and fell in love with it. My problem is I live in Minnesota and can't find it at our stores. What is the best way to purchase some? Will it be coming to our area soon or is it somewhere now? Thanks Jeff C.
High energy & the ton of sunflower seeds give me a kick! I eat Mona's Granola in so many ways, even adding it to my morning smoothies. My grandsons love Mona's Granola. They take to their baseball games. Wish you could be in Rochester, NY too! Visiting Florida, I was pleased to be able to find you in Publix. Wish you could sell at Wegman's (Rochester NY), seems like your kind of store similar to Publix. Not just for me, but for many people, good to expand your business. I'm glad to know you ship too.